Today I wanted to share my Batkartoffeln recipe with you. This recipe is so simple in it’s execution and ingredients that I actually contemplated whether its worth posting. But in my mission to put together a complete resource for German recipes – Bratkartoffeln should not be missed. It is also so tasty that I have to share it! 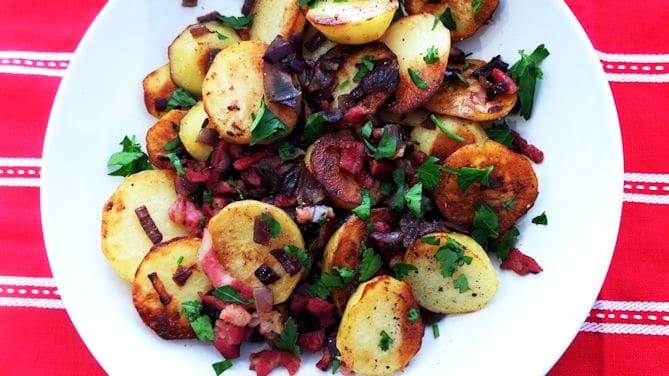 Bratkartoffeln (literally translated Fried Potatoes) is a very popular German dish. In restaurants it is offered as a side dish and at home it’s seen as a quick and tasty way of using up left over potatoes from the day before. Basically boiled potatoes are fried with bacon lardons and onions until crispy. My tip is to remove the bacon and onions after frying, and add them back in once the potatoes have been browned, because otherwise you might burn them. There are lots of different variations to this dish; and sometimes we eat it as a main course with scrambled eggs and season it with fresh rosemary. My husband (who is English/Lebanese) loves this dish – and will never get enough of it. The recipe I chose to post today suggests you use butter to fry your potatoes in because they end up a little crispier, but if you want you can use oil instead. I made these to go with my Viennese Schnitzel… but that recipe I am saving for another blog post. – (update – i made it here is the recipe for my Viennese Schnitzel. Hope you enjoy this Bratkartoffeln recipe! 400 g boiled potatoes (from the day before) - sliced about 5 cm thick. Heat one table spoon butter in a large frying pan; then fry the bacon lardons for 2 minutes and then add the onion until they are beginning to brown. Remove both from the pan and keep in a bowl for later. Now heat the other table spoon butter. Add the potatoes and fry them on medium heat until crispy. Don't stir the potatoes, just carefully turn them to ensure that they are fried evenly. After 20 minutes add the bacon and onion and fry for another 2 minutes. Season with salt and pepper to taste and just before serving stir in 2 table spoons of fresh parsley. PS. These quantities are meant for a side dish. For a main dish just quantify the ingredients.